On May 1, Google changed the wording on its Palestinian website (http://www.google.ps) from “Google Palestinian Territories” to “Google Palestine”. This has angered some Israelis and has delighted some Palestinians. Most Palestinians live in two areas called the Gaza Strip and West Bank, often referred to as “Palestinian Territories”. The status of these two areas is contested. Let’s take a look at history to better understand the issues. For centuries, the Jewish and Palestinian people have both lived in the same geographical region. Today, the area is called Israel, but it was also called Palestine in the past. Since that region is “home” for both sets of people, they have strong disagreements about who should get to live where. In 1947, the United Nations (UN) proposed splitting the country into two regions – one for the Jewish people and one for Palestinians. They didn’t agree, and fighting broke out. By the time the initial fighting was over in 1948, the Jewish people had created a country called Israel. This was followed by a war between Israel and some Arab countries (Jordan, Egypt, and more). The war ended in 1949 but by then, many Palestinian people had fled to two areas. One was called the Gaza Strip, which borders Israel and Egypt, and was under Egyptian control. The other was called West Bank, which borders Israel and Jordan, and was under Jordan’s control. In 1967, there was another war between Israel and some Arab countries, including both Jordan and Egypt. At the end of the war, which lasted for 6 days, Israel took over both the Gaza Strip and West Bank. In the 1990s, agreements were signed by the Palestinian and Israeli leaders giving some control of the Gaza Strip and West Bank to the Palestinian people. Since then, the two groups have been trying to figure out how to split the land to create the country of Palestine. According to Israel, since the boundaries have not been agreed upon, the areas are Palestinian territories still under Israel, and therefore, are unhappy with Google’s wording change. Google’s decision to change its wording has made Palestinians happy because the American Internet company Google, whose services and products are used by billions around the globe, is referring to the area as Palestine and not as territories where the Palestinians live. The Palestinians have been trying to have the world recognize the Gaza Strip and West Bank as their independent country. The other nations of the world are also split on this issue. Some countries (for example, the United States and the United Kingdom) don’t recognize the areas as the country of Palestine, while some others (for example, Argentina and Brazil) do. The last country to do so was Guatemala in April this year. In 2011, UNESCO, the cultural and educational agency of the UN, admitted Palestine as a full member state. Last year, the UN made Palestine a non-member “observer state”. Palestine previously held the status of “observer entity”. Google has websites personalized for many countries and areas. For example, Google’s Australian website is http://www.google.com.au and the site says “Google Australia”. The United Nations is an international peace organization. There are 193 countries that are members of the UN. Israel joined the UN as a full member in 1949. The last country to be added as a member state of the UN was South Sudan in 2011. In 1996, Larry Page and Sergey Brin, the founders of Google, were working on a project together called ”BackRub” while doing their graduate work at Stanford University, USA. 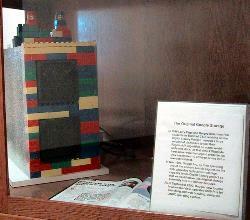 They needed a large amount of disk-space, and built a cabinet for it out of LEGO. BackRub went on to become Google. Google, TIME, U.S. Geological Survey, and NASA have taken images of Earth from 1984 to 2012 and stitched them together to create animations of our planet. You can watch them here.